The Tektronix AA5001 is a audio analyzer plug-in for the TM5000 system. Being the newer version of the AA501 it provides essentially the same features in the same package, adding GPIB programmability. It is intended to be used in conjunction with the SG5010. 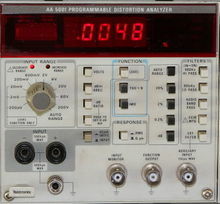 The DA4084 is a modified variant of the AA5001 that replaces IM measurement with a SINAD function for radio equipment maintenance and characterization. The DA4084 was supplied in a modified TM5003 rack with an unusable left slot, but also works in generic TM5000 mainframes. This page was last edited on 25 March 2019, at 15:17.